The ESW Progress Log is used to collect the number of hours that all our members put into Engineers for a Sustainable World whether it is volunteering at an event we promote, helping our organization by tabling or other activities, working on your individual projects, or anything else that is affiliated with ESW. These hours will be put into graphs to display the amount of hours that ESW-UCSD puts into service and projects as a whole. 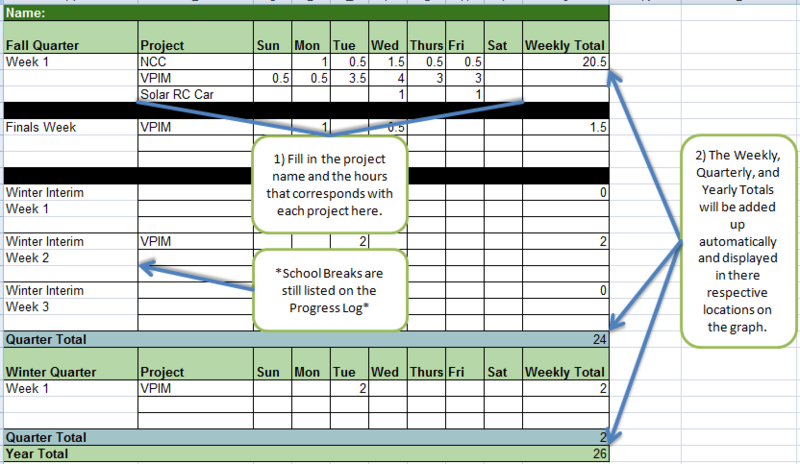 The progress logs also allow each individual member to keep track of how many hours they put into their projects routinely. You can use this to for self-motivation, self-assessment, or however you see fit, but the idea is that you keep track so that you know how many hours you actually put into ESW. 4) Click "Make a copy..."
5) Rename the file "[YOUR FIRST AND LAST NAME] ESW Progress Log" by inputting this information into the pop-up window. 9) Update the form on a weekly basis (no need to input 0s). 3) Go to "Download as"
4) Save it as an excel file and rename it "[YOUR FIRST AND LAST NAME] ESW Progress Log"
6) Update the form on a weekly basis (no need to input 0s) and email your most up-to-date file to esw.ucsd@gmail.com with the title of the file as the subject. Please submit the log at least twice a quarter.